The Madison is an idyllic and spacious base for a small family. This modest home design has a total of 2,827 square feet and has a finished floor area of 1,410 square feet. It features 2 bedrooms, a shared full bath, and a master bedroom with a walk-in closet and a full bath with a bathtub. In front of the shared bath is a space dedicated to a washer and dryer. One corner of the great room has an island kitchen, and there are provisions for a dining and living area. The front of the house has a covered porch, which is right beside the gate of the garage. The owners of the new home have the option to install bay windows in the master bedroom and the dining area in the great room. Additionally, they can also choose to expand the master bath to include a walk-in shower and a more spacious walk-in closet. 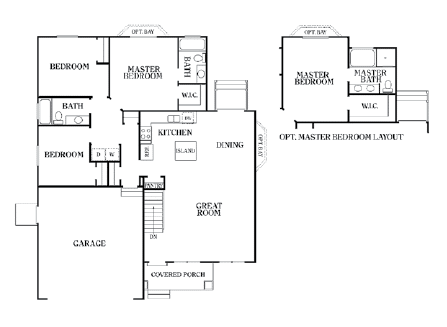 Choosing a house plan and constructing a home in Utah may be a stressful endeavor for many people, but not if you’re working with Perry Homes. It’s our goal to make the entire process as smooth and as seamless as possible, so you can truly enjoy the process of customizing and building your family’s next home. To do this, we’ll assign you a design center personnel who can help you narrow down your many options and come up with a home that suits your lifestyle. Perry Homes has constructed heritage homes and developed communities in Utah for more than 40 years. Aside from building homes, we also offer exceptional customer service from the design phase until you move into your new home. Call us at 801-264-8800 and start building your new home today.